Tsars come in all shapes, sizes and scents — from the gigantic, most likely musky-cumin-y-indolic-smelling Peter the Great (Unwashed) to the diminutive Nicholas II who had a penchant for fine French and English toiletries. 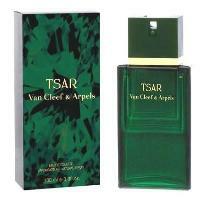 Van Cleef & Arpels’ “fancy”-fougère Tsar was developed by perfumer Philippe Bousseton, and released in 1989. When I first smelled it long ago, Tsar was “too much” to bear (or wear); today, not many perfumes are too much for me, so I decided to give Tsar a re-try. Tsar includes fragrance notes of bergamot, artemisia, rosemary, caraway seed, juniper berry, cinnamon, geranium, jasmine, pine, vetiver, oak moss, sandalwood and amber. Tsar begins with the scents of bergamot, artemisia (wormwood), juniper berry and a droplet of cinnamon oil. Quickly, one smells rosemary, pine and geranium leaf. Tsar’s opening is “green”, but NOT crisp or juicy; it's smooth and polished. As Tsar segues into its heart notes, I detect creamy "white flowers" in quantity small enough not to annoy, or scare, manly-men. Tsar’s base smells of amber-y wood tinged “green” with moss. What is Tsar’s overall effect? Imagine a scrubbed-clean gentleman (Le Tsar, c’est moi!) fresh from a sudsy bath tub; the steamy bathroom is full of the aromas of Swedish pine soap, floral-and-clove-scented pomade, and Eau de Cologne. Clouds of perfumed talcum powder merge with the fragrant steam and create a moist “wall of scent.” Don’t go near Tsar if you dislike strong perfume. Note: top image of Tsar Alexander II [altered] via Wikimedia Commons. Don’t get started on Tsar’s “kissing cousins.” Didn’t the Tsar’s extensive relationships (kinship and treaties) with other european royalty contribute to the outbreak of WWI? It certainly contributed to the hemophilia that ran among Queen Victoria’s descendants…..
Joliefleurs: and the hemophilia got Rasputin into the mix which made matters worse. Dilana: as you can see from my top image, I’m concentrating on the tsar that freed the serfs and who was in many ways “progressive.”. HA! Thanks for the review, sounds much too flowery for my DH – he still has a hard time with his Habit Rouge! Which is fine since it leaves more for me. Ruth: well, if he has trouble with Habit Rouge…. But to give him credit he has tried everything I’ve asked him to and is very patient with my endless “what do you think of this” accompanied by a wrist or elbow crook shoved under his nose. Interestingly his sample preference on me tends to be either animalic vintage or trashy modern fruity gourmands. Thanks for this review. I haven’t seen Tsar mentioned for ages. It was one of the first perfumes I used to wear back in the mid-nineties and while I have moved on, that smell will never escape me. Very strong and distinct! Michaelm: it’s one of those scents that you never hear about but MUST? have a following? Tsar nearly knocked me unconscious at Bergdorf’s years ago. I don’t think I’m as brave as you Kevin to give it another shot (at least not YET…) but your review is making me think twice, so I think that’s a compliment! Jeremy: try it on a COLD day! ONE spritz. Thanks for the vivid review! What a concept – a dapper gent who smells like a dapper gent. Blithie: it’s nice to have one or two “dapper” scents in the perfume cabinet…I don’t FEEL dapper many days in a week, that’s for sure. ESWIFT83: your dad would certainly notice the change more than me since it’s been 15 years since I smelled it! The bottle sold at Bergdorf’s and Neiman’s is the bottle shown in this post. The clear glass bottle with green juice…I don’t know when that stuff was sold but that’s what appears most often on discount sites…don’t know if it was a flanker or what. I believe I read somewhere that they just changed the bottle for a while, but now they’ve gone back to the “original” one… I got my hands on a decant of the vintage formula, though, for Father’s Day! Shhh, don’t tell. p.s. Great review, by the way! My dad would approve! ESWIFT: oh, good…I’m sure he’ll love the gift. PLEASE OH PLEASE, share your secret, my fathers birthday is tomorrow and I would like to “next-day” him a 3.3 fl Oz. / 100 ml bottle. Because as your father, he too, loves the scent, and was heavily disappointed with the “new” version, my mother(like your mum did for you dad) bought him last year for his birthday. Kevin, I love the picture (as always) and your description. This sounds so nice (assuming judicious application), but I get the impression it is truly masculine rather than unisex? nozknoz: I’m always wary of saying something is for men only or for women only because that leads to sharp disagreements! HA! But I will go out on a limb for you and say this does swing to the masculine side in my opinion. I remember reading somewhere that Serge Gainsbourg use to wear Tsar VCA… However, I’m not sure I like it. It is somewhere in between Haramis Havana and YSL Jazz, but it has a disturbing patchouli final note that I dislike quite a bit. Plus, this one screams to high heavens, it is potent and a bit too “in your face”. All in all, I just think it didn’t quite age well, it feel dated. I wonder wether VCA will come up with some flankers at some point. Talking of which, did I see an Eau de Tsar somewhere? I think I did in France, am I mixing it up with something else? Lupo: there were at least two flankers of Tsar, neither sold now. Eau du Tsar was one of them. When it was first launched, Tsar had quite a bit of tarragon, which is a spectacular thing for a man to smell like, warm, woody-green and anisic. The scent itself was way too strong for me to wear, but the shower gel was just right—–it left a sort of haze of the scent floating around you. Recent reformulations have destroyed Tsar, I think. It definitely isn’t what it used to be. R: when you compare old Tsar ingredients lists to the new list, things have changed. I wish I could smell the old version again.